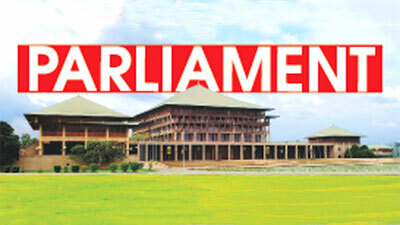 Parliament sessions were held yesterday without the participation of United Peoples Freedom Alliance (UPFA) MPs, with Speaker Karu Jayasuriya presiding. This is the fifth consecutive time that the UPFA boycotted the Parliamentary session since October. Meanwhile, UNP-MP Mayantha Dissanayake notified Parliament that the motion scheduled for yesterday would not be moved. The motion was scheduled for debate in Parliament yesterday and was in the Order Paper to be the first business of the day. However, Mayantha Dissanayake gave no specific reason for withdrawing the motion or any future date that it may be resubmitted. The motion in question, was filed by seven UNP lawmakers Wijepala Hettiarachchi, Harshana Rajakaruna, Mayantha Dissanayake, Mujibur Rahuman, Ajith Mannapperuma, Dr. Jayampathy Wickramaratne and Hirunika Premachandra proposing that the House take action in terms of Article 48 (2) of the Constitution. The motion held that, the appointing of MP Mahinda Rajapaksa by the President as the Prime Minister on October 26, 2018 and when a No-Confidence Motion minus the first paragraph of the motion was passed on November 14,2018 was moved to the House on November 16,2018 against MP Rajapaksa and the Government, it was passed; whereas, the first paragraph of the motion passed on November 14,2018 had been removed accordingly. It also held that the motion passed on November 16 is substantially a No-Confidence Motion against Mahinda Rajapaksa and the Government; and the Cabinet of Ministers stands dissolved in terms of Article 48 (2) of the Constitution. Meanwhile, the Adjournment Motion was moved in Parliament by the JVP-MP Nalinda Jayatissa and was taken up for debate. He said that due to the string of incidents that took place over the past five weeks, the country has been plunged into a state of anarchy and uncertainty and that the Parliament should focus attention with regard to the impact on the people, state mechanism and democracy in the country. He proposed that Parliament should mediate in bringing the country out of this state of anarchy and instability and establish stability in the country. “Had the President acted in accordance with the powers vested in him and in a Constitutional manner, this issue could have been resolved. Our country had a reputation of upholding democracy and democratically elected leaders. But due to the unconstitutional and high-handed actions of the President, the country has come to disrepute before the world,” he said. He noted that many tourists had cancelled their trips to Sri Lanka and as a result the tourism industry is in jeopardy. JVP MP Vijitha Herath seconding the motion told Parliament yesterday that President Maithripala Sirisensa now claims that he had taken these decisions as measures against corruption. “If he was against corruption, then he should have appointed a Commission to investigate the Bond scam within a week of it happening and based on its report, he should have punished those involved. However, to date he has not punished those who were involved or implemented the recommendations of the report. The president did not punish wrongdoers but instead he gave them ministerial positions,” he said. Participating in an adjournment debate on the current political situation, the MP said that the President had breached the constitution in number of occasions. “The President continued to violate the Constitutional provisions. The way he sacked Ranil Wickremesinghe from the Premiership was unconstitutional. The appointment of Mahinda Rajapaksa was also unconstitutional and the dissolution of parliament was also not constitutional,” MP Herath said. He noted that Mahinda Rajapaksa was better off with his flower bud party instead of having fallen into this trap that has destroyed his political ambitions and brought him into disrepute,” Herath said. Parliament was adjourned until 1.00 pm on December 12. President Maithripala Sirisena’s statement that ‘he would not appoint MP Ranil Wickremesinghe as the Prime Minister even though all 225 MPs requested’ was a humiliation to Parliament, UNP MP Lakshman Kiriella said. Speaking in Parliament at the commencement of the sittings yesterday, the MP pointed out that the Executive must be accountable to the Legislature. He further said that the judiciary with its interim order on December 3 reinforced Speaker Karu Jayasuriya’s ruling that there is no PM or Cabinet in the country. “We congratulate the Speaker on this achievement. Today, the country’s Constitution is being violated every day.The President even did not heed what the judiciary said. For the first time, the country does not have a valid PM or Cabinet. In such a situation, we admire the Speaker’s efforts to maintain stability in the country,” he added. UNP MP J.C. Alawathuwala said the President had no authority to order Ministry Secretaries and that he only has the authority to order Secretaries of Ministries under him. UNP MP Sujeewa Senasinghe inquired from the Speaker as to why he could not offer the PM’s seat to Ranil Wickremesinghe observing that his removal was illegal from the outset. He also pointed out that the appointments of Chairmen to state institutions after October 26 were illegal and that those appointments should immediately cease.